On a recent Called to Coach: India Edition, we spoke with Gallup-Certified Strengths Coach, Namrata Jajoo. 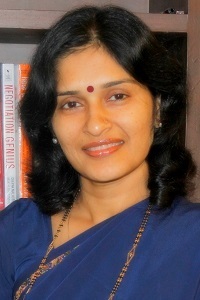 Namrata is passion about putting strengths at the center of India's classrooms. She has worked on having all of her students take Clifton StrengtsFinder. After they take the assessment, Namrata holds a number of group coaching sessions with them. The first session focuses on aspirations. Namrata asks students questions like, "What do you want to be when you grow up?," "What do you do well?," and "Where are there potential challenges in the future? After that, Namrata has student coaching sessions on Name Your Strengths, Claim Your Strengths and Aim Your Strengths. This coaching session structure has lead some of Namrata's students to find their calling in life. To hear more about how strengths are transforming the lives of students and teachers in India, please watch the video or listen to the audio above. With over 15 years of cumulative experience in Management Roles with corporations such as NIIT, Aptech and Mahatma Gandhi Mission, Namrata has a diverse experience in the fields of Education, Corporate Communications and Business Development. Her corporate background together with her experience in Education Management forms a strong foundation for her to contribute as a Clifton StrengthsFinder coach for students and young adults. Namrata's top 5 strengths are Strategic, Responsibility, Learner, Connectedness and Individualization.